On Saturday 8 November, Westminster Central Hall in London will be hosting an event celebrating Hammer Films. The British studio, famed for its classic horror output, was founded in 1934, making it 80 years old. To say ‘happy birthday’, a large cast of players from Hammer’s history will be gathering to meet fans, sign autographs and talk about their experiences making cult gems such as Vampire Circus and Frankenstein And The Monster From Hell. My name’s Darren and I’m a giant-ape-oholic. That’s right, I’m addicted to giant-ape-ohol – a cheeky and highly intoxicating substance that’s a key ingredient in more films than you might imagine. My DVD collection houses 28 of them, at last count. 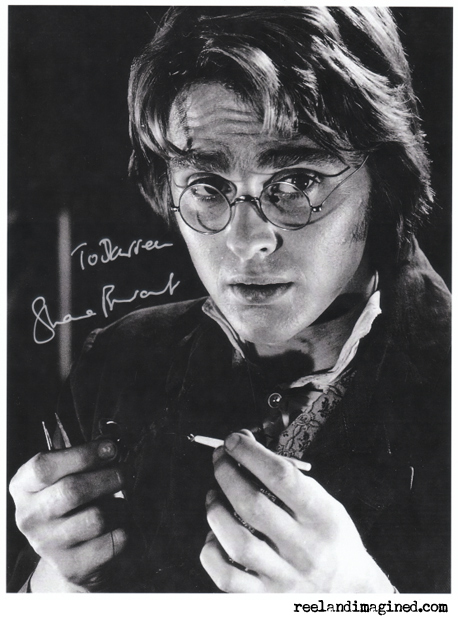 And, as you might expect, I’m partial to related collectables too, such as autographs. Which is why, today, I find myself standing in the lobby of Westminster Central Hall, handing over a crisp five-pound note to gain entry to the London Film Memorabilia Convention, where a certain Paul Stockman is a guest. In 1961, Mr Stockman donned a hairy suit to play the titular character in Konga, one of only two British entries in the giant-ape genre (the other being the comedy Queen Kong from 1976) and a film that I’d regard as a guilty pleasure if I felt any guilt. Of course I can’t defend it as high art – it’s a daft production through and through, with its species-changing ape and not-always-so-special effects – but the presence of Michael Gough, who plays the dastardly Dr Decker, makes it very watchable. I find the film charming and, in the end (the very end), quite affecting. If you’re interested in my full and proper thoughts on the movie, have a read of my review. I’ll still be here when you get back, I promise. 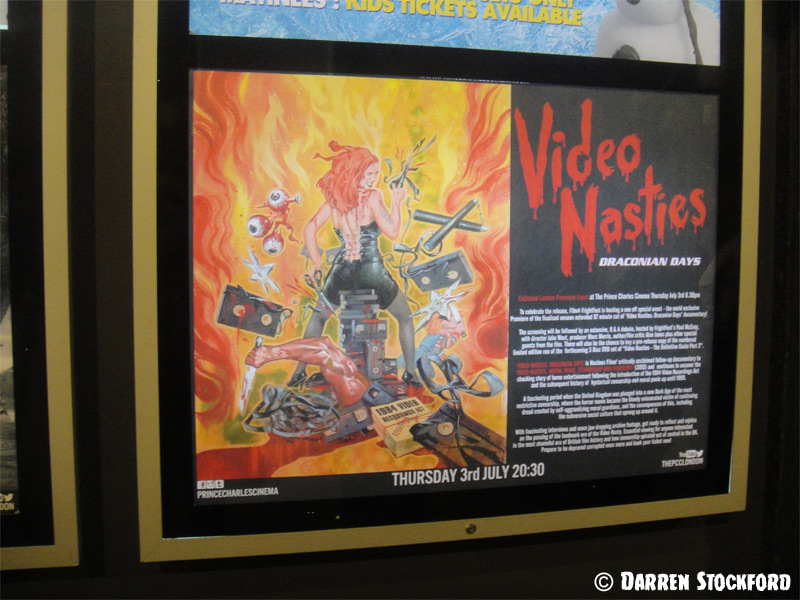 It’s Thursday 3 July and I’m at London’s Prince Charles Cinema, just off Leicester Square, to see Video Nasties – Draconian Days, the follow-up to Jake West’s 2010 documentary Video Nasties – Moral Panic, Censorship And Videotape. Billed as a world premiere of the 97-minute cut, the event, which has been organised by FrightFest, has attracted a close-to-sell-out crowd. West is here, along with the producer Marc Morris and some of the film’s participants, to take part in a post-screening Q&A. It’s reportedly the warmest day of the year, and I’m glad of the cinema’s air-con. “If you’re feeling hot and bothered,” says Morris in his brief introduction, “this will make your blood boil”. Draconian Days picks up the story of UK film censorship in 1984, with the passing of the Video Recordings Act, and takes it through to the late 1990s and James Ferman’s resignation from the BBFC. Ferman, the organisation’s director from 1975, was notoriously – and I guess you could say ironically – bloody-minded in his treatment of certain horror films. He certainly wasn’t going to grant The Exorcist a certificate for home viewing, and he wouldn’t give the original Texas Chain Saw Massacre a theatrical one, either. Update 11 June 2014: Sadly, this event has been cancelled, with a view to staging it next year instead. In the meantime, Hammer fans might want to turn their gaze towards an official event that’s happening in Westminster on Saturday 8 November. Below is my original article about the event that 10th Planet planned to run. It’s a bit early, I know, to be discussing Halloween (the day, not the film – it’s never too early for that). However, if, like me, you’re a fan of the soundtracks to the films Lucio Fulci directed in his horror heyday then plans must be made right now, because this All Hallows’ Eve, Fabio Frizzi and his seven-piece band are coming to London to play live, and tickets ain’t gonna be around for long. Frizzi, who scored a number of Fulci’s films, including Zombie Flesh-Eaters (1979), City Of The Living Dead (1980), The Beyond (1981), Manhattan Baby (1982) and Nightmare Concert (1990), will be playing the Union Chapel, a gorgeous venue – and actual working church – in Islington, north London, on 31 October. When Richard Johnson delivered the famous opening line in Lucio Fulci’s Zombie Flesh-Eaters, little did he know that three decades later his words would gain a double meaning. In the recent UK blu-ray release the boat doesn’t just leave the undead-infested Caribbean island of Matul; it leaves the film itself – or at least a sizable portion of its hull does. Six seconds of the boat’s initial appearance in New York Harbor, directly after the opening credits, have been accidentally cut from the movie (note: just the blu-ray – the DVD is fine), leading to the distributor, Arrow Films, repressing the disc and offering replacements to customers. Hammer Blu-rays: What the Devil is going on? 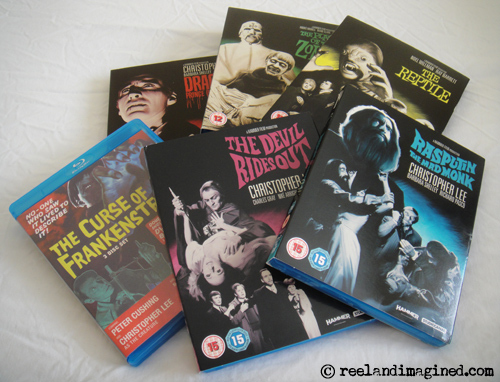 If you have an interest in vintage British horror films, you can’t have failed to notice that Hammer’s UK Blu-ray releases this year have got fans of the studio in a bit of a dither. Battles have raged online over various issues, from image and audio quality to aspect ratio and framing, and, perhaps most controversially, CGI tinkering. To its credit, Hammer has responded in detail to many of the issues, even recalling and reissuing one product to correct an audio fault. However, there is still much about these discs and their problems that confuses me, and there are still a few questions that Hammer has yet to even try to answer, despite saying that it will. “You are invited to attend a day in celebration of Shane Briant.” So ran the (A5, stiff and rather good-looking) ticket that I received in the post back in May, after despatching a £30 cheque to Donald Fearney. 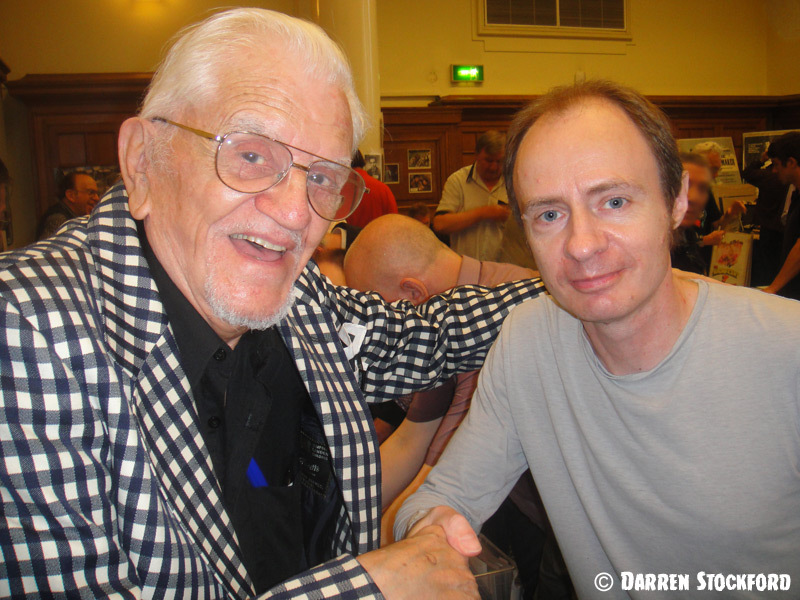 A newbie to Mr Fearney’s legendary Hammer-themed get-togethers, I didn’t really know what to expect, but I knew that the opportunity to meet Shane Briant – for the actor would be in attendance at this celebration – wasn’t one I should pass up. The venue was to be the Cine Lumiere in Kensington, where Briant’s final film for Hammer, Frankenstein And The Monster From Hell, would also be screened. However, a couple of months before the big day, some behind-the-scenes kerfuffle led to the event having to be relocated and the screening scrapped. Hence, last Saturday morning, I made my way up to Hackney to visit a church hall called the Round Chapel. Last Saturday night I went along to Sound Of Fear, a two-part event at London’s Southbank Centre. The main draw for me was a 45-minute set from Alan Howarth, the musician and composer who collaborated with John Carpenter on many of his much-loved ’80s scores, such as Escape From New York, Halloween III: Season Of The Witch and Prince Of Darkness. 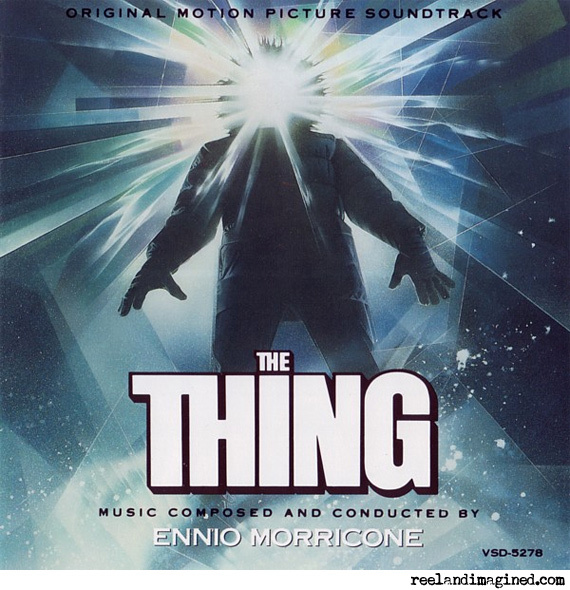 The performance in the venue’s Purcell Room, which I loved every pulsating second of, covered all these scores, plus Big Trouble In Little China, Halloween II, Christine, They Live, and even Ennio Morricone’s brooding music for The Thing. Howarth was accompanied on stage by a woman whose name I didn’t catch, who appeared to be operating a live video mixer. It was an understandable addition, given that this music was designed to accompany images, but one I found distracting at times – the repetition, intrusive effects and speed changes mostly failing to capture the mood of the original films. I’d have preferred some simple compilation clips. Is that the time? I’d better have another rummage around the giant-ape genre, I think. 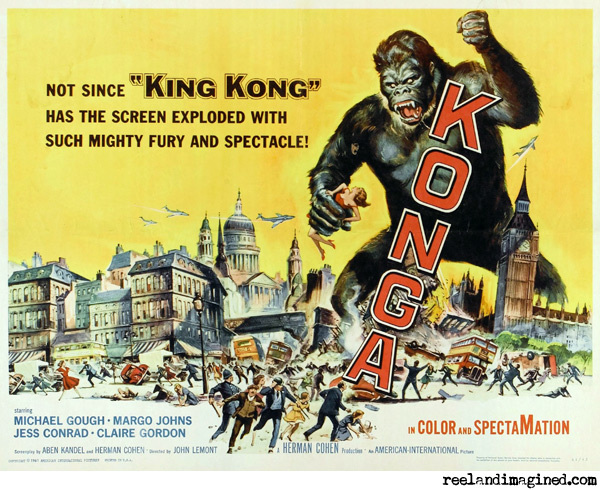 Today, I’m taking a look at Konga (1961), starring Michael Gough, who died in March aged 94. As always with these in-depth reviews, beware: there are heavy spoilers ahead, including the film’s ending. A light aircraft crashes in a Ugandan jungle, igniting in a ball of flame. It’s feared that its famous occupant, English botanist Doctor Charles Decker (Michael Gough), was killed in the explosion along with the pilot. One year later, however, a very-much-alive Decker returns to London, explaining that he’d managed to bail out of the plane before the crash, and had spent the past 12 months living with a native tribe while conducting experiments on insectivorous plants. His groundbreaking findings, he claims, will establish a close link between plant and animal life. Phew, time travelling really takes it out of a guy. How’s that for a dramatic lead-in to a whinge about the joys of jetlag? Approximately 30 hours have passed since Tara and I arrived back in the UK after a 12-day gallivant on t’other side of t’Atlantic. Our jaunt began with a week in Tennessee, a return trip (we first visited in 2004) that we decided to make with my parents, who wanted to visit Graceland, the home of Mr Elvis A Presley. The site hasn’t changed much in four years, despite being under new management. 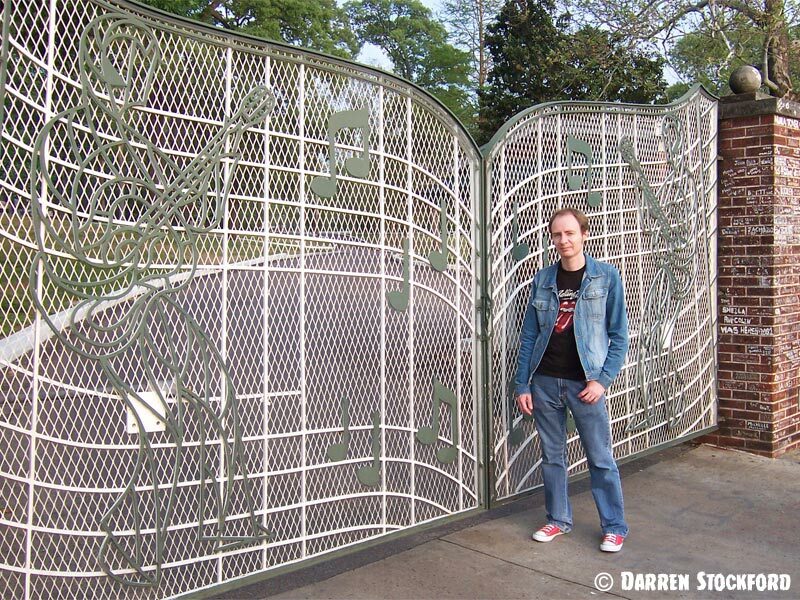 The mansion and its grounds, plus a handful of museums across the road, are worthy and moving tributes to the man, his music and his life; the gift shops (both official and unofficial) are, for the most part, giant mountains of tat.